The US, Great Britain, India, Portugal, Austria,... 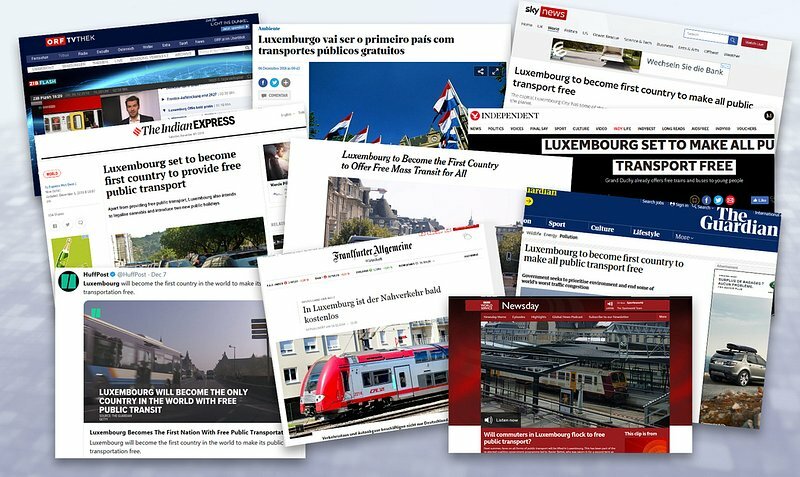 The announcement that Luxembourg will be the first country to introduce free public transport made headlines across the globe. After the coalition agreement was made public this week, Luxembourg made it into the headlines of several big international publications. Apart from the legalisation of recreational cannabis, Luxembourg announced that public transport will become free within the next couple of years. Portugal's "Jornal de Notícias" reported on Luxembourg's bid to make public transport free for everyone. The news spread across the globe, with India's "Indian Express", Austria's "ORF" and the German "Frankfurter Allgemeine Zeitung" picking the subject up. In Great Britain, "The Guardian", the "BBC", "Sky News" and "Independent" published articles with their take on the story. The Telegraph: Luxembourg becomes first country to make all public transport free – could London ever follow suit? BBC: Will commuters in Luxembourg flock to free public transport?